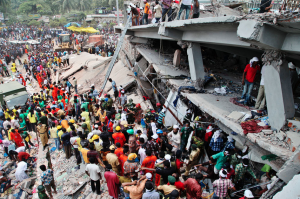 On April 24, 2013 in Savar Upazila of Dhaka District, Bangladesh a five story commercial building called the Rana Plaza collapsed and killed 1,134 people. On May 13, 2013 rescue efforts where halted and approximately 2,500 people were rescued, but injured from the collapsed building. 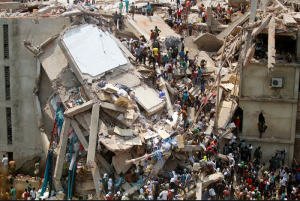 This incident is considered the deadliest garment-factory accident in recent history. So why did an accident like this happen in modern day? Keep on reading to find out. The 400 page report exposed multiple causes in why the building collapsed. One of which, the mayor and owners of the building wrongfully granted construction permits to have additional floors built. To make this situation even worse they used substandard materials, and ignored building code violations while constructing the new floors. In order for the factory to remain efficient the owners had large generators installed on the upper floors, so the factory could keep producing when blackouts occurred. This added lots of strain and weight to the already poorly built upper levels. The report reflects that every time the generators would turn on it would shake the building. On April 23, cracks began to form in the foundations and walls. An engineer was called in to examine the building and declared it unsafe, but the owners demanded that their works return despite the unsafe working conditions. Then on April 24, 2013 during the morning rush hour the building collapsed. Major disasters are often wake-up calls for how important it is to ensure that they never happen again. TapRooT® Root Cause Analysis is taught globally to help industries avoid them. Our 5-Day TapRooT® Advanced Root Cause Analysis Team Leader Training offers advanced tools and techniques to find and fix root causes reactively and significant issues that may lead to major problems proactively. To learn more about our courses and their locations click on the links below.